Sweden takes its Eurovision Song Contest (ESC) entrees very seriously, and that’s not surprising as they have done consistently well in the world’s highest profile singing competition, with six wins resulting in hosting six spectacular finals – the most recent in 2016 – and finishing in the top five 24 times! Since 1959, the Swedish entry each year has been chosen via an annual televised competition, known since 1967 as the Melodifestivalen. Organised by public broadcasters Sveriges Television (STV) and Sveriges Radio (SR) in 2002, the Melodifestivalen started touring to six key cities around the country with a final in Stockholm, and it’s become one of the most popular programmes on Swedish television. 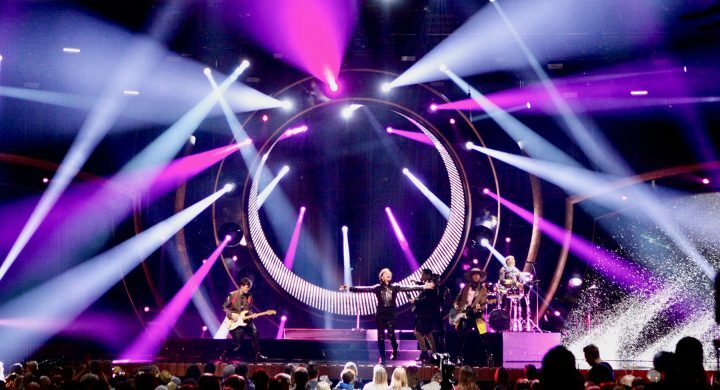 Lighting designer Fredrik Jonsson of Eyebrow Design has lit Melodifestivalen since 2002, and this year he specified 38 x Robe MegaPointes, 8 x BMFL Spots – being used as a RoboSpot remote follow spot system – and 21 x BMFL WashBeams to help make the 2019 event stand out for its exceptional production values. A new set design each year ensures the show’s aesthetics keep looking fresh, relevant. Related to that is the requirement for a totally different lighting approach. Fredrik, set designer Viktor Brattström and technical director Tobias Aberg first met up in summer 2018 to start the first discussions and ideas for creative direction for the 2019 event. Many of the competitors now have their own creative teams, so production has to incorporate their ideas where possible or mould them to work in the specific production environment which is being created for that year. The overarching mission is to collaboratively produce a vibrant, lively and dynamic showcase offering each of the 28 contestants a unique look onstage! That is the constant challenge … and that’s also why Fredrik was keen to use multifunctional fixtures like MegaPointe and BMFL. This year’s initial brief from STV was that they wanted a more organic looking stage with lots of arcs, curves and softer shapes to evoke a warmer and more classical TV look. This was a departure from the last couple of years where the styling has been more raw and edgy, with lots of geometric objects, very clear sightlines and defined perspectives, a bit like an angular piece of modernist art. A dominant double circular shape defined the stage and the large stage left LED screen was framed by softer shapes to suit the more fluid fashioning of the set. Viktor already pre-empted some of the lighting positions in his drawings, as his arcs and circles were accentuated with moving lights and figurative lightsources. Fredrik looked at these and later defined and finalised the sources that would work best. The circular centrepiece featured two prominent and dramatic concentric circles with a bunch of lights integrally fitted to the structure to provide sumptuous, big, bold sweeping Pink Floydesque looks which were very impressive. Early on in the process, Fredrik realised that there was little point in trying to compliment these strong shapes and imposing centrepiece with lighting trusses in the roof, so instead he opted for an altogether simpler, more uncomplicated look above the stage that optimised the angles he needed and gave some serious ‘bang-for-buck’. In addition to creating the 28 artist / song looks, he also had to light six elaborate opening sequences and six intermission performances … so they needed multiple options and a fixture like MegaPointe was an obvious choice! The 38 x MegaPointes were primarily rigged on the two main centrepiece circles, with a few more deployed around the stage floor for contrasting beam-work and cutting across the diagonals. They worked hard throughout the show providing most of the eye-and-camera candy and making the circles come alive with fast and funky beam work, gobo’ing and texturing on to the scenic elements and all over the stage. The 21 x BMFL WashBeams were used for key lighting and over-stage illumination from the rear and combined well with the MegaPointes for the massive signature aerial scenes. Fredrik was keen to use MegaPointes because he likes the optics. It was actually the first time he’s spec’d them onto a show, but he’s played with them on several demos and knew they would be perfect for his creative goals. They also all knew beforehand that there would be weight challenges in flying the circular structure, so having lightweight fixtures on it was a key requirement. At 22kg each, the MegaPointe gives an exceptional performance for its small size and weight. “The optics are really crisp, and they have so many features that we need” he commented. 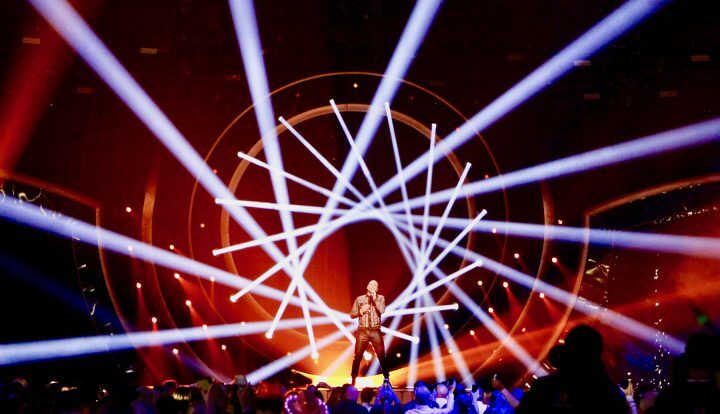 BMFL WashBeams were also new for Fredrik, and he tried these based on the recommendation of a colleague – although he’s used BMFL Spots frequently on previous shows, including the 2016 Eurovision Song Contest Final in Stockholm, for which he was the LD. “When I researched the fixture, I was delighted by the sheer size of the lens and the quality of the optics and the light coming out” he stated. As a fan of fat, chunky lenses due to the texture of light they produce – as they were intended to be used as key lights – the feature was literally THE ‘key’. 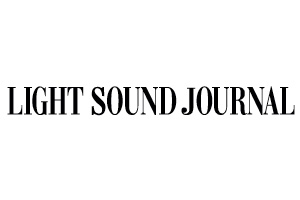 The fact that they also have shutters “tipped the scales”. Without any fresnels or traditional fixtures for key lighting, he used the BMFL WashBeams “like a proper follow spot”. He loves the colour rendering, the brightness and the punch. He also notes that on the stage they could cover huge surfaces with a soft gobo wash and snap from that to being “punchy as hell” and razor sharp when needed. The RoboSpot system was also a solution for some of the visual challenges posed by the stage and set design. They had two separate performance areas, both with ‘sweet spots’ at 10-degree angles from the stage edges … with the main camera stationed 27 metres away. Due to the low headroom in some of the arenas on the tour, he could not rig his follow spots above the cameras and needed to be closer to the stage get the correct angles, which meant having two different front follow spot positions. 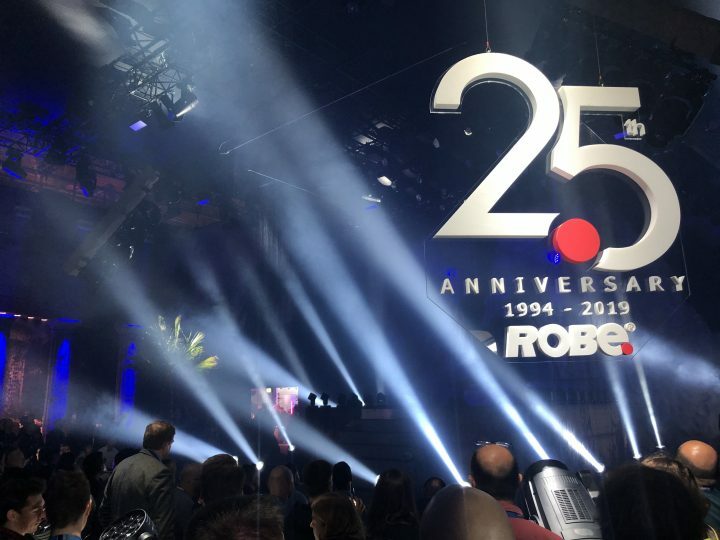 They used two sections of pre-rigged truss, each with four BMFL Spots divided between two RoboSpot BaseStations, with the two fixtures for one system divided by a stage right / left gap of around 4.5 metres. To give a straight angle onto the artists that aligned with the lens of the main camera, two spots per system were constantly on the performer, with the RoboSpot operators concentrating on the intensity and iris, while the console operator choose the fixture – left or right – to give enough intensity and the correct side angle according to the performance area in use. The same set up was utilised for the back follow spots, however these were separated by a gap of around 8 metres. There was also no need to have crew working up in the roof dealing with smoke, pyro and heat, and they skipped the process of getting the ops into position and up ladders above the middle of the audience before the start of the gig! In addition to the Robes, Fredrik utilised around 130 other moving lights, LED PARs, LED strobes, and ARRI Skypanel LED softlights. All the lighting was controlled by two grandMA2 consoles in a network running via Luminex nodes and DMX splitters. The main LED video screen this year was a 2.6 mm HD surface on stage left used mainly for acts with their own custom interactive content. At Fredrik’s request, it was covered in a flat transparent plexi surface that made it shiny, black and less visible when turned off. It also enabled him to get more bounce and less hit on it when his key lights got close! The screen output level was dialled right down to balance nicely with the lighting rig and the cameras. The middle of the large circle onstage is filled with a turbine shaped LED strip array built from slightly concave ROE strips which made the circle’s dimeter smaller at the back and the strips visible. Fredrik used these for colour and strobe effects. 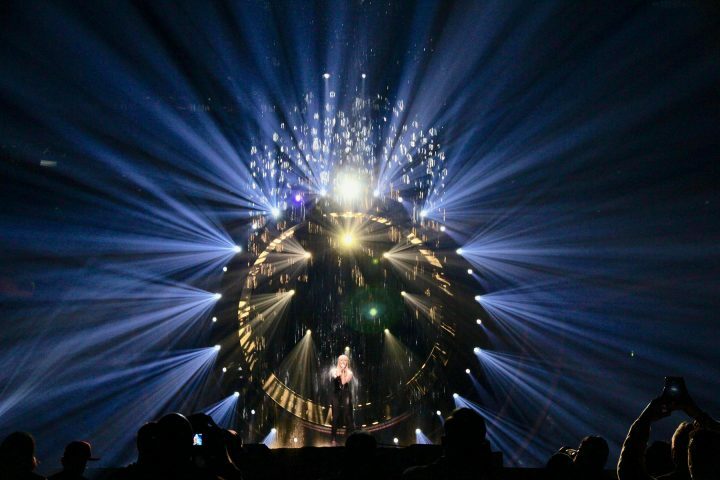 The challenges of touring a show of this size and complexity was in building an immersive almost 360-degree environment – effectively a mini Eurovision – in such a short time window each week as well as keeping all the artists happy and having an appropriate creative impact for each song. Working alongside Fredrik were lighting operators Danne Persson and Timo Kauristo, media server programmer Fredrik Stormby and lighting crew chief Peter “Angry” Andersson. Lighting equipment was supplied by Mediatec Solutions from Stockholm. Sweden’s Eurovision 2019 selection was won by John Lundvik with the catchy “Too Late for Love”.